The RISER community explores beautiful routes every day, enriching the app and platform with inspiration and lots of routes that become an inspiration for others. So why isn't there an award for discovering great routes? Right, we don't know either! That's why we created the RISER Adventure Award - an award for which you only have to do what you like best: riding your motorcycle! What is the RISER Adventure Award? From now on, RISER will award the prize annually - but whoever wins will be decided by the community: ten users will compete for the award with one trip each. The RISER Community gives Likes to their favorite routes of the nominees for one month. Who has more Likes at the end, wins! How do you become a nominee? Every RISER user has the chance to be nominated through the recorded trips. It's not the duration or speed of the trip that counts, but the question of whether the route is really fun on the bike. The more interesting trips you track, the higher the chance of finding your own trip among the nominated routes for the Adventure Award. The nominees will be notified by the RISER team by e-mail (registration address in the APP) and asked for their consent to participate before the start of the voting. In addition, 5 RISER PRO memberships for 1 year, were raffled among all users participating in the voting. 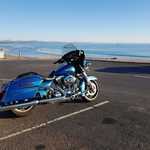 Kameri Labinot on his Harley Davidson - Electra Glide Ultra Limited FLHTK and with his trip -HARLEY IS HOME-. 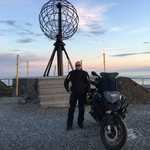 Starting in Kosovo, across Albania, Montenegro, Bosnia-Herzegovina and Croatia, through beautiful coastlines and stops like in the charming old town of Budva (MNE), Kameri drove his Harley on the winning route 2018, collecting the most Likes with the exceptionally beautiful route and sharing a special trip tip for all bikers of the RISER community. Thanks for that!